Ollie has discovered music. He dances during our family dance parties, bouncing along and swaying with a huge grin on his face. One of the bounciest songs is the bizarre and ear-wormrific “What Does the Fox Say?” by the Norwegian brothers known as Ylvis. If you haven’t seen it, which tropical island hosted your shipwreck? Shake the sand out of your pants and go watch. 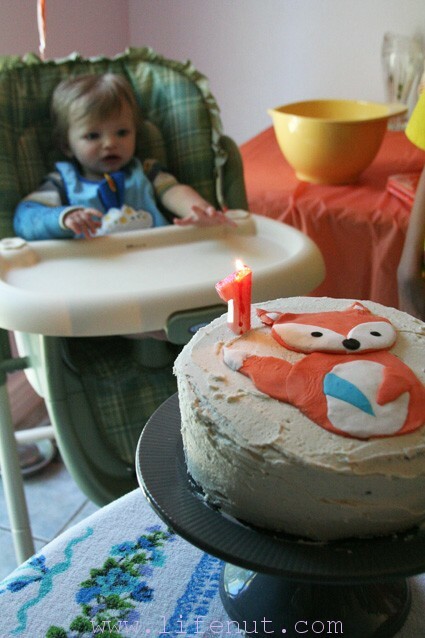 When Ollie’s birthday was approaching, I wanted to think of a theme that would fit his loves and capture the moment in time he turned one. The fox song kept coming up. 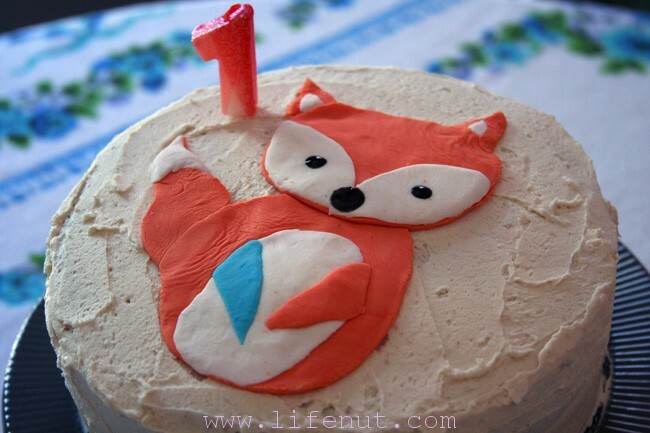 Let’s do a baby fox first birthday! I needed to keep it simple and easy, to match my skill set. I decided to make chocolate cupcakes and one two-layer snickerdoodle cake. Bravely—for me—I decided to work with fondant again. It went relatively well with Beatrix’s sixth birthday cake. I figured I could make a fox after poking around online and finding a few easy-looking examples. I didn’t want to outright copy any fox, so I changed the shapes and added Ollie’s cast. I wasn’t sure what to do about the chocolate cupcakes, though. I wanted them to be somewhat festive, but didn’t have the time to get elaborate. 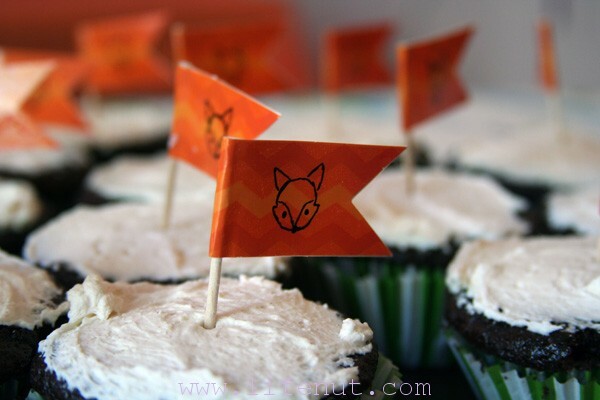 When Aidan and I were shopping at Hobby Lobby for the fondant, we saw little chevron-striped orange flags. I grabbed a pack, not knowing what exactly I’d do with them. While strolling up and down the aisles, she mentioned she could draw little fox faces on them. Sold! She did such an awesome job. 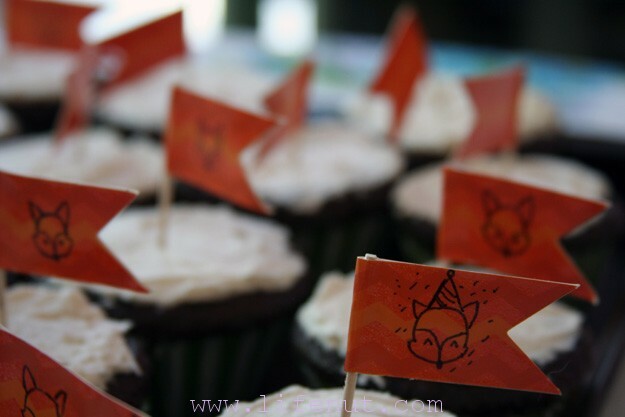 She also came up with the idea to make a special festive fox denoting Ollie’s personal cupcake. Here are links to the cake recipes I used. The cupcakes and the two layer cake turned out really well. For the frosting, I made a simple buttercream and added cinnamon. I’m happy with the way it all turned out. 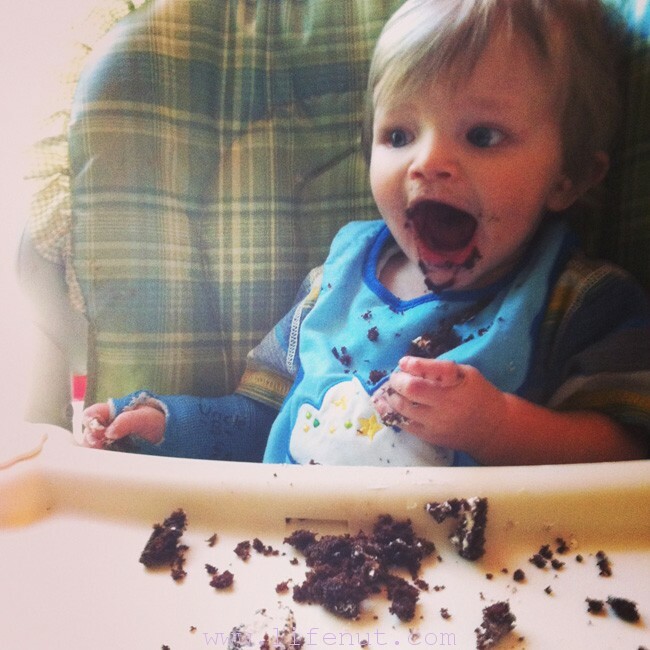 He loved his chocolate cupcake and all the attention. se7en recently posted..Se7en’s Fabulous Friday Fun #191 And Post #2000!! !